After logging in, you are taken directly to the Home page. This page is divided into three convenient sections to help you navigate to every feature within Online Banking. 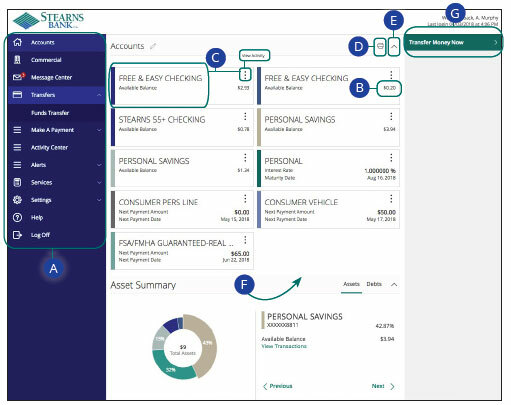 Here you can view the balances in your Stearns Bank accounts, see your account summaries and more! The navigation bar appears in every view on the left side of the screen. You can navigate Online Banking features by selecting the appropriate drop-down tab. Your Stearns Bank accounts are displayed in an account card with their balances. If you click an account name, you are taken to the Account Details page. You can also click the icon on the right side of an account card and select View Activity for more details. The icon allows you to print a summary of current available funds in your accounts. You can expand or collapse account details by clicking the icon. If you click and hold an account card, you can drag and drop it to a new location to change the order in which your accounts appear. The Quick Action links in the top right corner allow you to quickly access different Online Banking features.